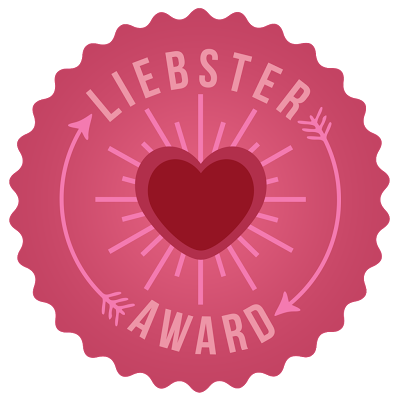 Yesterday I discovered that there was something called “Liebster Award”. By the way many people seem to turn that into into “Leibster Award”, which is wrong. “Liebster” is a German word meaning “dearest”. Well anyway today I wake up and see that Maureen from Neoteric wool has nominated me for a Liebster Award. That’s another thing: doesn’t it have to be “awarded me a Liebster Awards”? I’m not a native speaker but wouldn’t “nominate” imply that at some point in time someone would choose a winner that the award would be given too? Don’t get me wrong, I’m not complaining or anything, on the contrary, I’m very excited. But now let’s get started. Choose eleven people (with fewer than 200 followers) to give this award to and link to them in your post. Go to their blog and tell them. My course of studies included Linguistics (English and Spanish) and ever since I’ve been quite aware of language and try to at least notice mistakes or wonder when something sounds weird (see above…). If I tell people than this is no critic. I just want to mention I noticed. I love travelling (you might notice from my blog name) and hope we get to go on a three weeks trip to see something exciting this fall. I’m a total sucker for nailpolish and can name most of the ones I own by heart. At the moment my nails are a dark nearly red rasberry pink (p2, 170 french kiss) that is a bit pinker than in the picture, which is not a usual colour for me as I dislike nearly all pinks and reds. 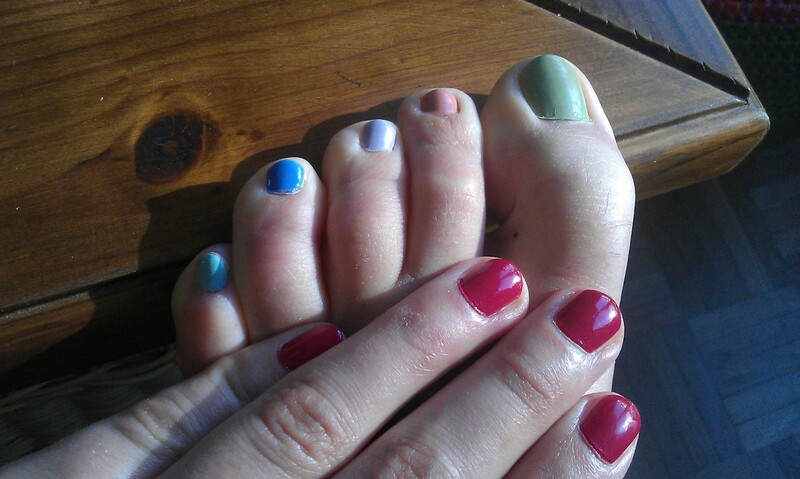 My toenails are painted in light blue (essie, bikini so teeny), lilac (essie, lilacism), light green (essie, navigate her), mint green (essie, mint apple candy) and rose (essie, eternal optimist) – each toe a different colour. Even though I own a car, I prefer going places with my bike especially now that spring is here. There is only two things that can stop me from riding my bike to work and this is pouring rain and snow or ice on the streets. When I was 18 I thought that getting a belly button piercing was the thing to do but have taken it out some years ago. I bought a scarf yesterday and it is oh so lovely: coral coloured with little beige polka dots. Don’t worry, as you can see, it clashes nicely with my pink nails. I spend two years abroad, one when I was 19 in Spain and the other one when I was 25 in Australia. Both stays broadend my horizont. 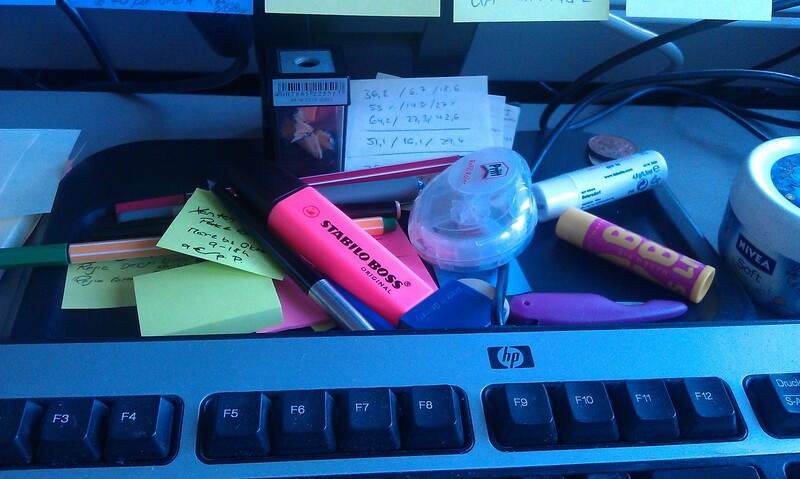 This is what the space behind my keyboard under my screen looks like here at work. I prefer still to sparkling water which is normal in most parts of the world except for Germany. I can trace back my ancestors on my father’s side to a man named Philipp Schnorr from a little village of Münchholzhausen about 70km north of Frankfurt who fought for the Swedish army during the Thirty Years’ War in the 16th century. What is your typical Wednesday night like? Watching tv and knitting. Where would you like to travel to? Many places. I hope we can see Mexico and Belize this fall. I would love to go back to South East Asia, maybe this time seeing Vietnam & Laos. Indonesia would be interesting too. Since I was 8 years old I dream about taking the Transib one day to go from Moskow to Beijing. And one day I want to walk at least a part of the Camino de Santiago in Spain without being very Christian but for the feeling and the landscape and I would love to walk the Overland track in Tasmania. Yes, I would actually like to go back to Australia again to do some more travelling there. What is the smell that reminds you of your childhood? Sunscreen. It smells like summer vacations. What snack do most often reach for? I should say fruit but I guess it is cookies. If you could have any occupation besides the one you have now, what would it be? See no. 7 of the random facts about me. What is your favorite book? Hard to tell. 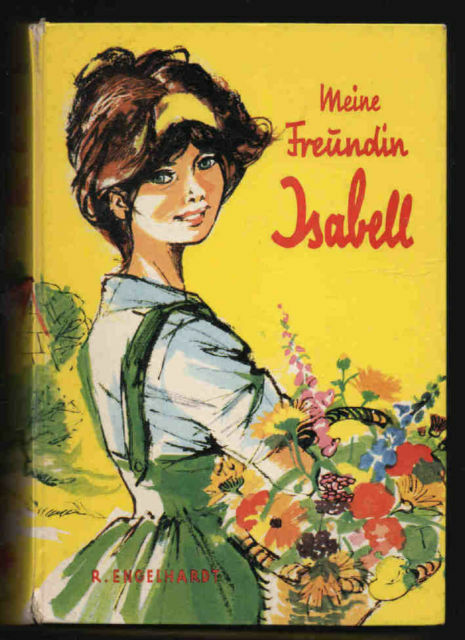 But I think the book that I’ve read most is a girl’s book from 1961: “Meine Freundin Isabell” by Ruth Engelhardt. A love story from the 50s. I guess my mum got it as a teenager and it was living on a shelf at my grandma’s house where I would read it every holiday I spend there. And still I love it. It is such a 50’s story but so lovely. Who is the main person you lean on in life? Since we’ve been together: Michael. Overall in my life: my parents. What is your favorite article of clothing? A comfy dress depending on its length and the season we are in paired with leggings. What is your favourite craft and when and who did you learn it from? What is the first holiday you remeber? Where would you recommend I should definitively on a vacation one day? This is a very German question: Toast or “real”bread? Do houseplants survive in your care? What is it you definitively want to achieve in 2013? What is your favourite colour for a) nails b) clothing c) furniture d) walls in your home? Now, who do I give the Liebster Award too? This entry was posted in At home and tagged Opinion by kathatravelling. Bookmark the permalink. so ein Schwachsinn, nicht not, sondern know, kennen. Seltsame Tastatur mit Eigenleben. do you not the podcasts: grammar girls and Sozusagen? Nein, aber muss ich mal suchen. Pingback: Be Lazy Blogger; Reap Rewards; Repeat | Wie sagt man...?